While traveling to the European fashion capitals for the summer men’s-wear collections, I had the pleasure of seeing some women’s fashion, too. And thank God none of it was part of the many pre-collection cruise and capsule lines that have transformed the fashion calendar into a year-long nonstop season, with breaks only for July 4, Thanksgiving and Christmas. In Florence, at the Galleria del Costume of Palazzo Pitti — a small fashion museum with a rich permanent collection shown in the rooms of the royal family apartment, with beautiful views and access to the Giardino di Boboli — there is a smart, concise show through July 16 dedicated to fashions from Sardinia. As peculiar and marginal as this subject may sound, “Sardegna veste la Moda” really focused on a larger and absolutely up-to-date theme: Local versus Global. And I do not mean the habit of the Italian prime minister, Silvio Berlusconi, who has been accused of consorting with young women in his villa in Sardinia versus the lifestyles of other presidents in other drug- and money-filled summer resorts. In the first part of the exhibition, each room was dedicated to a sartorial technique — embroidering, say, or pleating — or to a specific type of garment — white shirts or shawls — with multiple ethnic examples from every part of the world as opposed to just modern applications by contemporary designers. You could admire a pleated peasant skirt from Sardinia next to one from China, a Martin Margiela deconstructed kilt next to a Christian Dior “New Look” skirt, a forgotten Romeo Gigli pleated empire dress next to an Issey Miyake pleated tube. Because of the the presentation and the relationship created among designers — some of the garments just hung, while others were displayed flat — walking though the show is a less predictable experience then it sounds. Also, the richness, the beauty and the surprises found in the traditional Sardinian clothing presented in this modern international context enabled you to see how the Sardinian clothes could leave the realm of ethnology and enter into the history of fashion. The history of this wild, poor and little-known island off the cost of Italy, north of the better-known Sicily and south of French Corsica, deserves more attention, too, as its people kept for centuries their own language, their own cuisine and their own dressing traditions in the middle of the Mediterranean Sea, even as the island changed hands many times from one kingdom to another empire under cultural dominations of every faith. The last three rooms in the exhibition are assigned to contemporary designers from Sardinia, all still working from there, though each has an international following: Antonio Marras, also the creative director for the Japanese brand Kenzo, which is owned by the French company LVMH; Angelo Figus, an Antwerp graduate and London designer; and Silvio Betterelli. Each one created a site-specific installation, incorporating elements of his work and his philosophy, that was far different than a retrospective or a showroom display. 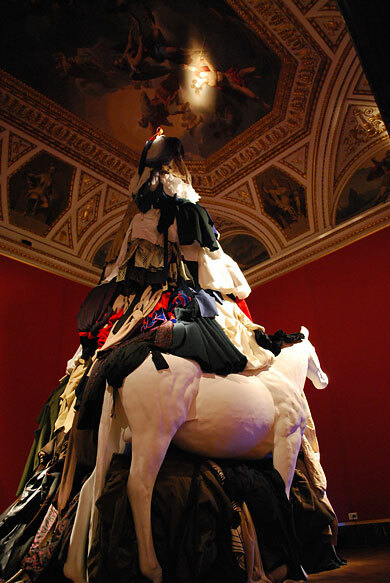 A decadent but romantic sculpture made of dismantled doors had a beautiful embroidered gown by Marras at its center. A ceiling-high pyramid of deconstructed garments by Figus was followed by a combination of leather outfits and accessories in simple cages and boxes by Betterelli. For a moment, I wished I had been born in Sardinia and not Florence, where the genes are maybe too inbred and the city too homogenized to upset the effects of rampant globalization. In Paris, fashion was also in the air. Or, I should say, fashion history! Having just left behind the cultural desert and ignorance that make Milan the least expected fashion capital, I made a quick visit to Azzedine Alaïa’s showroom, where I had the privilege of admiring a small exhibition of Schiaparrelli clothes – “Garde-robe de 1936 a 1950” — that Alaïa decided to host for three days before they will be sold at auction at Drouot Richelieu on Friday, July 3. The more expected and better-known garments got an added value when explained by the maestro himself. 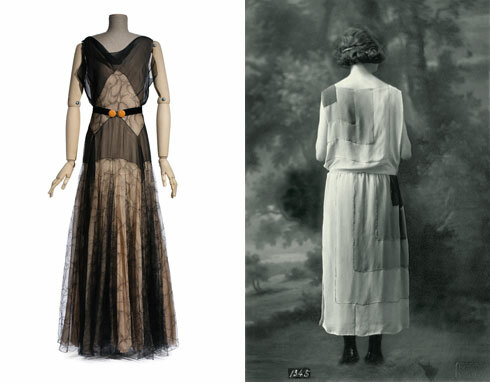 The main exhibition at the Musée de la Mode and des Art Decoratifs at the Louvre had opened the night before I arrived in Paris, but people were still talking about the incredible longevity of Madame Vionnet’s clothes. I visited the museum with a friend and her daughter, which took away the pressure of looking at so many dead clothes and thinking of dead people wearing them, something I always feel when fashion designers are celebrated in a museum. The selection and the presentation — the show was curated by Pamela Golbin and designed by Andrée Putman — were flawless; the garments, in mirrored vitrines without any sets or unnecessary stenography, did all the talking. Little monitors next to each headless mannequin explained the garment and displayed vintage images of the garment worn front and back; these images were taken from the catalogs that Vionnet kept for every registered model she ever created. Now and then, some computer-generated images showed the cut of the garments and how they came together from a single piece of fabric. It was mesmerizing to see how two squares with a hole could, in Vionnet’s hands, become the most beautiful, simply draped gown. I am not a fashion historian, not even a fashion expert on women’s clothes, but the variety of the techniques used — she supposedly invented or popularized the bias cut — and her research into fabrics and their draping, along with the way she handled the marketing of her atelier, left me with the desire to read anything ever published on this woman, who led such an adventurous life. At an early age Vionnet left her husband and children to pursue her own career in England before coming back to Paris and opening her business in 1912. Whether she became a role model to women is not clear. But she certainly was an inspiration to generations of designers, male and female. As I wended my way through the show, organized by theme and technique, I could see in the models most of the clothes that I have looked at in the last 20 years. So it came as a surprise to me to discover in the last room that Madame Vionnet suddenly decided to close down her atelier and retire in 1939, declaring publicly that “she had said everything she had to say.” I wished many other designers would make such a wise decision at such an early age – she lived 40 years more and died in 1975. After her death, unfortunately, a different owner tried to revive the brand, and only few months ago we heard the news that a new designer, Rodolfo Paglialunga, has been put in place under the ownership of Matteo Marzotto — the antagonist in the Valentino movie — and Gianni Castiglione, the other half of Marni. Poor Madame Vionnet! What a sad fate! I was wondering what she would have to say about it, after making such a historical remark about retiring. Not having the opportunity to ask her, I asked Karl Lagerfeld a few nights later. The great fashion historian and connoisseur of life explained that she or somebody for her made up that remark making virtue out of necessity. In reality, the Vionnet Company was not doing well financially, many of her garments from 1937 to 1939 were the work of a talented staff, the war was at the door, and it was time to move on. When she returned to Paris after the war, most of the talent she had relied on had opened their own couture houses independent of the dictatorship of the old system and it was suddenly impossible to reopen. Lagerfeld added that this is the reason he never wanted his own fashion house: because you then have an expiration date. He added, finally, that when you leave you never can come back. For sure, he knows better then anybody else.